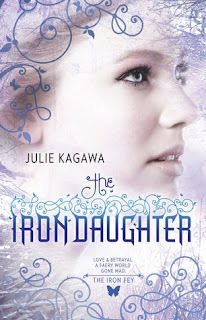 The Iron Daughter by Julie Kagawa is the second book in the Iron Fey series and thus may contain spoilers to the previous book, The Iron King. I didn't think it possible, but I loved The Iron Daughter by Julie Kagawa even more than I loved The Iron King. Despite not always loving books that deal with faeries, I absolutely adore the Iron Fey series! The Iron Daughter begins with Meghan being a voluntary prisoner in the Winter court as per her agreement with Ash during the first book. Whilst there, dangerous and deadly things begin to happen that are meant to encite war between the Winter and Summer Courts. Meghan witnesses the events but her account of the Iron Fey is not believed. Running for her life, Meghan must begin to trust the ice-cold Prince who brought her to the Winter court in the first place. Everything that I loved about the first book in the series is present here in The Iron Daughter - an interesting premise, great characters, great interaction between them, action and romance. And Grimalkin. As for the relationship between Meghan and Ash, I really wanted to shake Meghan at times and tell her to open her eyes and see what's really going on between her and Ash. From the beginning of the book, he's quite clear in telling her how things will be when surrounded by other Winter court fairies, and still Meghan seems to only hear what she wants to hear and can't quite see the hidden meaning behind how mean and uncaring Ash acts towards her. It did make me sad for her and it is quite a shock as I wasn't expecting such a turnaround of their relationship from the previous book either. Still, if things were rosy and perfect between the two it wouldn't be nearly as interesting! Me? I'm a fan of the conflict! There's some really great characters in this book, both old and new. I think the conflict between Ash and Meghan, the impending war between fairy courts, and the urgency at which Meghan and her motley collection of friends must find a way to fix things and save the Fey world really sets a high tempo when reading. I really just couldn't put the book down and wanted more and more. And just as I felt the Iron fey were an unexpected twist in the previous book, The Iron Daughter has its fair share of 'ooh, I had no idea THAT would happen' moments. I'm absolutely dying to know how the rest of the series plays out. Great book, and I highly recommend the series! LOVE (x1000) this series so much!! Glad you enjoyed it. Love this seires as well! I've got the Iron Queen sitting in my TBR pile. I can't wait to get to it!! I loved this one too! I felt the same about Meghan, I really wanted her to wake up! But I still loved the book, and the ending - whoa. Glad you enjoyed it, thanks for the review! Sophie - I really realoly love this series! I can't for the third book! Becca - The Iron Queen hasn't been published here yet :( I'm getting impatient! Do you know if this book is available in other languages?